An Addlestone man has been jailed for 17 months after robbing a woman of her handbag as she walked home after a night out in Woking in 2017. Jamie Cook, 20, of Woodham Lane, Addlestone, who had already pleaded guilty to the robbery at an earlier hearing, was also ordered to pay a £140 victim surcharge when he appeared at Guildford Crown Court last week. Hayley Razzell, 27, of Eden Grove Road, West Byfleet, also pleaded guilty to robbery in relation to the same incident and was sentenced to 10 months’ imprisonment, which was suspended for 12 months. She was ordered to carry out 80 hours of unpaid work and to pay £350 compensation to the victim, £150 in costs and a £115 victim surcharge. The victim was walking home along Victoria Way around 10.30pm on 2 November 2017 following a night out with friends when she was confronted by Razzell and Cook. They grabbed her handbag forcefully from her, and stole her mobile phone from her coat pocket, causing it to rip. A member of public chased after the pair and detained Razzell nearby. He managed to grab Cook’s backpack from him before Cook ran off. Officers arrived and Razzell was arrested on suspicion of robbery. 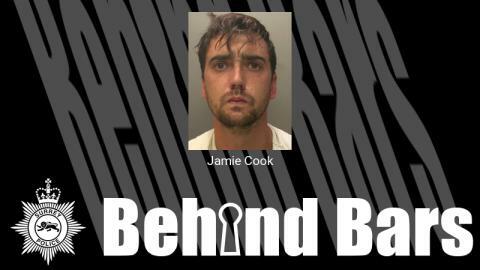 Further examination of the backpack revealed a wallet containing a bank card in Cook’s name and he was also arrested on suspicion of robbery. The pair had initially pleaded not guilty but changed their plea on the day the trial was due to start. Woking Neighbourhood Officer PC Sarah Wentworth said: “The victim was walking home after a night out when she was confronted by Razzell and Cook. They ripped her bag from the crook of her arm before taking her phone from her coat pocket. Although she was not injured, she was understandably left extremely shaken as a result of her ordeal. I hope that the sentences given to Razzell and Cook will help her to put the experience behind her.